Recognized for an Art Nouveau style all his own, French architect Hector Guimard (1867-1942) designed over a hundred buildings during a prolific fifteen-year span: 1898-1913. He is perhaps best known for having devised the iconic Paris Metro entrance in 1907, a wide-spread scheme employing standardized components that recreate natural forms through the structural and sculptural potential of cast iron. Guimard created gesamkunstwerks, an approach indicative of the time but also what he believed was the responsibility of modern architects. The majority of Guimard’s projects concentrated in Paris’s wealthier western districts and surrounding suburbs, and most of Guimard’s clientele came from the same social circle, which accounted, in part, for something of a stylistic homogeneity. Villa Hemsy (1913) wouldn’t have been an exception if it weren’t for a marked change in Guimard’s style and even suggestions of client modification prior to and after construction. As the last house Guimard designed in the ‘villa-style,’ Villa Hemsy – inspired by more modest country homes in Normandy – was completed just before the start of World War I. Villa Hemsy demonstrates a symmetrical regularity, prismatic volumes, and verticality more indicative of modernist prefabrication than would have been identifiable in Guimard’s previous projects. The only element that suggests the architect’s hand is an enveloping roof. 4 The use of simple materials such as cut stone, brick and wood as well as basic ironwork furthers this house’s mystery but does hint at the end of Art Nouveau and prefabricated model homes Guimard designed after the war. 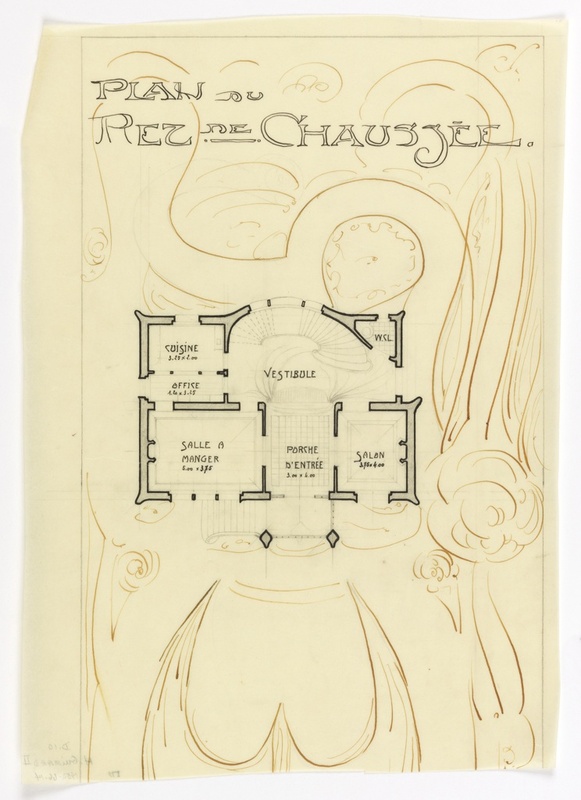 A series of ink, pencil drawings and subsequent blue prints plans and elevations – donated to both the Cooper Hewitt Drawings, Prints, and Graphic Design Collection, as well as the Avery Architecture and Fine Art Library by Madame Hector Guimard in 1940 – reveal rooms encased within whiplash curved walls as well as abstract floral designs, extending through the surrounding grounds. F. Borsi and E. Godoli, Hector Guimard, Paris 1900 (Brussels, 1976), p. 86. Claire Cass, “Hector Guimard: Architect and Designe,” Hector Guimard: Architectural Elements (New York: Jason Jacques Gallery Press, 2007). George Vigne, “A Private Person,” Hector Guimard: Architect Design 1867-1942 (New York: Delano Greenidge Editions, 2003): p. 13. George Vigne, “Villa Hemsy,” Hector Guimard: Architect Design 1867-1942 (New York: Delano Greenidge Editions, 2003): p. 330. Phillippe Thiébaut, François Chachin and Pierre Arizzoli-Clémentel, “Villas et Hôtels,” Guimard (Paris: Réunion des Musée Nationaux, 1992): p.330. Drawing, Villa of M. Hemsy, St. Cloud, Plan du Rez de Chaussee, 1913. pen and black ink, graphite on paper. Gift of Mme. Hector Guimard. 1950-66-14.